The site is located just outside of Cuzco/Cusco, at a height of 3.555 meters above the sea level, higher than Machu Picchu. The ruins are located where the districts San Cristobál and Cuzco meet (both of them parts of the Cuzco province and department). Sacsayhuamán used to be an Inca fortress, battles between the locals and the Spaniards took place here. The immense fortress was put together with huge stone blocks, but nobody knows how these components were cut, moved and put into place. Sacsayhuamán’s architecture reflects great skills, knowledge. From the point of view of construction, it is more impressive and mysterious than Machu Picchu (which is rather admired for its beautiful location, remoteness and little known past). Many travelers who travel to Machu Picchu also take the time to visit this wonder of the Incas. It is so close to Cuzco that you can go visit on foot. Visiting this marvel of the Incas can be a unique experience, if you’re in Cuzco, then this is a “must see” attraction. Interestingly, the Incas have built Cuzco in the shape of a Puma, which was a holy animal in the belief of the ancient Incas. While Cuzco was the belly of the Puma, this fortress was its head. Often mentioned as Muyuq Marka (most correct in Quechuan), Muyuqmarca or Muyucmarka, Moyoc Marca is a small Inca ruin consisting of 3 concentric circular walls, all connected with radial walls. It is located within the Sacsayhuamán archaeological site. 3 water channels were constructed which were probably used to fill a reservoir in the centre of the site. Not much is known about Muyucmarca, there are a multitude of theories, speculations around what its purpose might have been. Chronicle writer Garcilaso de la Vega wrote that there were 3 towers at Muyucmarca, at the top of the walls. The towers were constructed at equal distances from each other, forming a triangle. The main tower was erected in the centre and it was a cylindrical-shaped one, this was called Muyuq Marca/Muyuqmarca (or the other variations of the name, as you wish), the other 2 were: Paucar Marca and Sallaq Marca or Sallacmarca/Sallaqmarca, these were both rectangular shape. Why was the main tower round and the other 2 rectangular remain unknown. Round towers are less stable, allowing lower maximum heights. If one wants to construct high structures, then rectangular shapes are ideal, because they offer more stability. Sacsayhuamán used to be a huge fortress of the Incas, which was said to have has high towers and could hold over 5.000 people. Today the structure is in ruins, but still impresses with its size and architectural mysteries. Some of the stone blocks that were used to construct it are as large as a medium-sized truck and are still in place today. Without any sort of mortar, these immense blocks, some weighing over 50 tons, are still tightly stuck together like puzzles. The biggest stone block of the fortress weights around 120 tons. For comparison: this is twice the weight of an M1 Abrams tank. Imagine, how did the Incas move such an immense piece of rock with precision? No to mention, how did they cut these blocks so that they perfectly fit together. Sacsayhuamán, called the “House of the Sun” during Inca times was overrun by Spanish conquistador Francisco Pizarro’s army and much of it destroyed. Francisco Pizarro’s younger brother, Juán Pizarro was seriously wounded in a battle here and died the next day. Sacsayhuamán is one of the most impressive structures that you’ll ever find in Peru. The Spaniards were shocked to discover how the Incas have constructed such an immense fortress. In military technology the Spaniards were far superior to the Incas, a culture which the invaders considered inferior to theirs (of course, the Incas didn’t deserve to be degraded in such a way). Some Spanish priests and chronicle-writers, among which Cieza de León, Garcilaso de la Vega, Bernabe Cobo, Sarmiento de Gamboa, Pedro Pizarro have labeled the fortress as one “built by demons, evil spirits”. Some people believe, even today, that the structure was not constructed by the Incas, the ancestors of today’s Quechuans. Their fantasies revolve around extraterrestrials that could have arrived to our planet and either build the huge fortress or have taught the Incas how to do it. Writers like Erich Von Däniken have a multitude of theories around such places (like the Nazca lines in Peru and Tiahuanaco in Bolivia). A simple analysis of the style of the construction, the materials used are considered to be proof enough by specialists that indeed, Sacsayhuamán was erected by the Incas. Specialists argue about what the builders of this marvel had to do in order to cut , move and lift the stones in order to put them into the right places. Some estimate the necessary working force for building Sacsayhuamán at around 20.000-30.000 thousand men. the necessary period to complete the work should have been around 60 years. Specialists put the probable year of completion of Sacsayhuamán at 1508. Which means it was not finished long before Pizarro first reached Inca land (which happened in 1526, but did not implicate any conflicts between the Spaniards and the locals). Interestingly, the initial structure (not the ruins we see today) was described by the Spaniards as having high “towers”. Specialists say that Sacsayhuamán was more than 3 m higher that it is today. Above the large stone blocks lay smaller stones, probably the size for those that were used to build Machu Picchu, for example. The upper layer comprised of these smaller pieces of stone was demolished by the Spaniards who used those stones to build themselves homes and Catholic churches. At the time the Spanish forces arrive to this part of the Tahuantinsuyo, none of the Incas seemed to know how the structure was built. 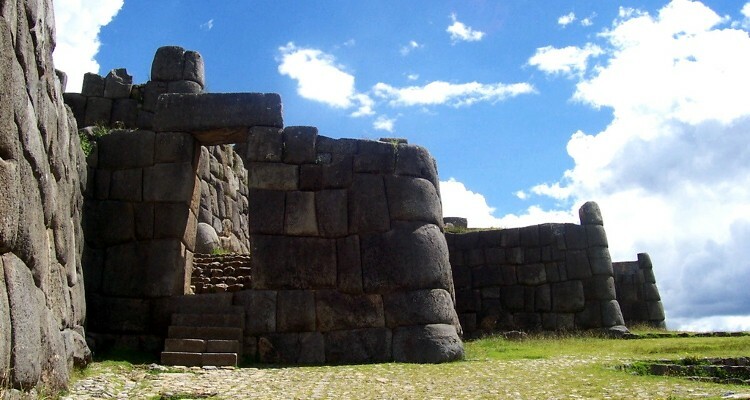 Some specialists conclude that the theoretical year of completion of 1508 was in fact the year when the Incas placed the smaller stone layer on top of the bigger blocks. This is why some doubt that the Incas placed the big stones. The Incas didn’t use wheeled vehicles (such as chariots) and to the Spaniards they seemed technically behind. You can get to Sacsayhuamán by one of the 2 roads that lead there: one starts from the old neighbourhood of San Cristobál and the other one from Avenida Collasuyo. The San Cristobál has 1,5 kms, while the Avenida Collasuyo one 4 km. Other, less frequented paths can get you there on foot, these are the Sapantiana (which starts at the Choquechaca street), has a length of 1 km, there another one from the San Blas district, which reaches the Kusilluyog temple, through an old Inca road (which connects with Collasuyo). You can walk to Sacsayhuamán or rent a bicycle, it’s not so far.